The Hudson Reclining Loveseat with Power Lumbar, Headrest and Footrest by Cheers at Royal Furniture in the Memphis, Nashville, Jackson, Birmingham area. Product availability may vary. Contact us for the most current availability on this product. 5623-HCE Storage Console 1 14" 41" 42"
5623-AL1-1EHZ Left Recliner to Loveseat 1 33" 41" 42"
5623-AR1-1EHZ Right Recliner to Loveseat 1 33" 41" 42"
The Hudson power reclining group in a luxurious Bolero Coffee leather is the perfect collection to fit everyone in the home. 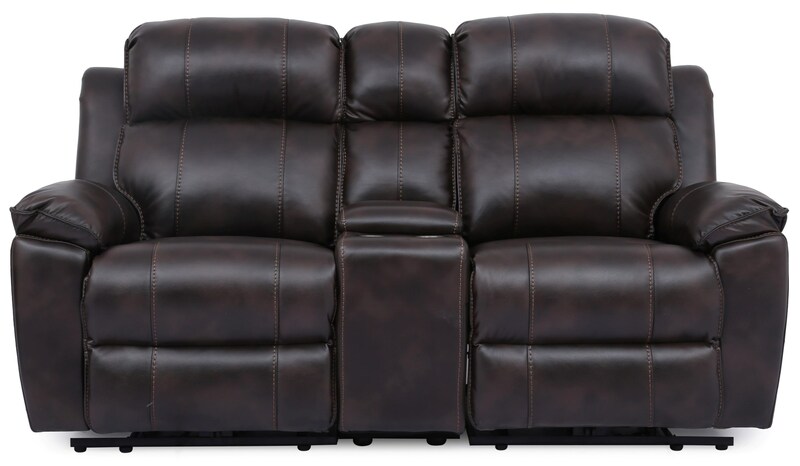 With power button controls to adjust the headrest, lumbar support and extend the footrest, a perfectly comfortable fit is just a fingertip away. With the built in USB port, you can charge your electronics while you relax. Whether you are furnishing a family room, man cave or formal living room, the Hudson Power group will be a perfect fit. The Hudson collection is a great option if you are looking for Contemporary furniture in the Memphis, Nashville, Jackson, Birmingham area. Browse other items in the Hudson collection from Royal Furniture in the Memphis, Nashville, Jackson, Birmingham area.